Techies Sphere: How to configure Auto-Approval of patches in WSUS Server? 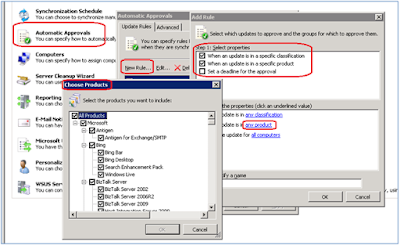 How to configure Auto-Approval of patches in WSUS Server? 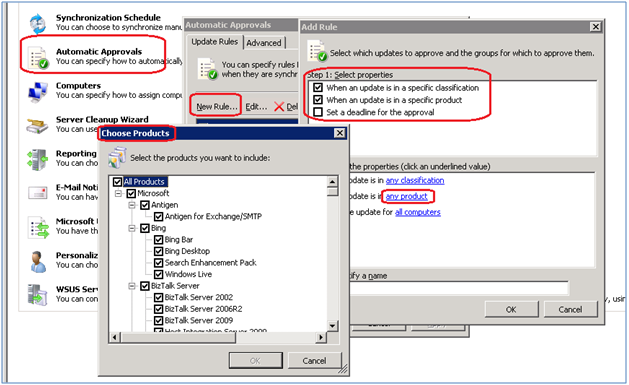 Please go to WSUS Server console, expand “OPTION”, Open “Automatic Approval” , Click on New Rule, and Create a Rule as per your requirement of products and here you are done. All the selected product’s patches will be automatically approved for targeted groups in WSUS Console. Click on Automatic Approval > Click on New Rule > Select the Category "Specific Product or Specific Classification" > Click on "Any Classification or Any Product" > Choose the Products for Automatic Approval of patches. Refer the below screen shot for GUI view, how it will appear?